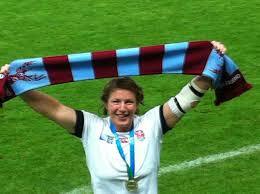 Huge congratulations to England Women's prop (and Chesham Stags coach) Rochelle Clarke. On Wednesday she equalled Jason Leonard's 114 cap record and today 'Rocky' has been named in the England starting XV to take on Ireland on Sunday. That will be 115 caps, whereupon she will become England's most capped rugby player ever.